There are many different versions of the Bible, some being easier to understand in modern English, and some that are more for the scholarly. I really like NKJV and it is the one we use in our homeschool. One of the main reasons is that is it also the version we use at church. There is nothing more confusing for a young kid than to try to follow along in their Bible while the pastor or youth pastor is reading in the Word, and they have a different version and can't keep up. To help those truths of the Word be cemented into place, we use the same on that the pastor uses. Airship Genesis Kids Study Bible is designed by one of my favorite pastors, Dr David Jeremiah. That made it even more exciting for me, that I have followed many of his sermons and have found his teaching to be in line with the Word. This is the kind of commentator I want in the version my own children are using. Designed for children 7-11, my 9 year old has loved this Bible since he first saw it. He never forgets it when we are heading out the door to church and enjoys showing everyone in his class. 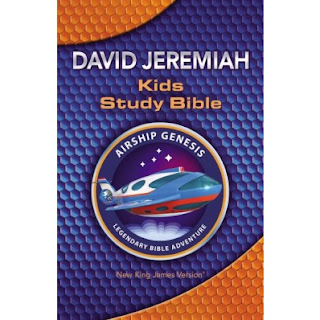 The Airship Genesis brand also includes a monthly audio series on DavidJeremiah.org and website with extensive content for kids. Enter to win a copy of the NKJV Airship Genesis Kids Study Bible!! Thanks for the great review. Declan and Jackson have been asking for a Bible to study so I would probably gift it to one of them. I didn't know such a tool existed til your review. This sounds like it would be a great first Bible for my nephew!